If you are looking for a new Fairfield Fencing Service, you have landed at the right place. 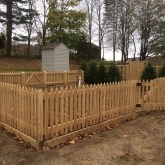 We have a large team of experts working at Roots Landscaping who have finished dozens of fencing projects within the New Fairfield, CT area. We pride ourselves on excellent repairs and service for everyone who uses our company. You have more than likely seen a project or two that we have completed when you drive through the city! We can handle any job, from small ones to big ones. The first question to ask yourself when you are planning to have a fence installed is what it is for, as there are many different options to choose from. You may want privacy from neighbors or need a safety fence for your children or pets. Whatever reason is yours, Roots Landscaping in New Fairfield will help you complete the project. 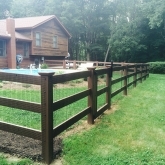 Our qualified fence partners provide each customer with high-quality, sturdy fences. Want to know more about fencing projects? Visit us here. 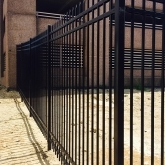 You can rest assured when you call us that we will provide you with quality installation for many different types of fences. You will always want to hire a professional fence installer as you may find unexpected problems that are difficult to get around if you try to do it on your own. 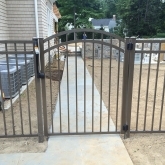 We will first consult with you to determine the best type of fence for your needs and land. From there, Roots Landscaping will measure your yard, check out the terrain, and install your fence securely and properly. Costs of each fence differ depending on how tall the fence is, the material that is used and how much of the material is needed. You may already own a fence but you need repairs done to it. We can help. Our employees are knowledgeable when it comes to figuring out just what type of repair you need. Wood rot is a common problem found in many fences. Fungi get into the wood, eat away and it and cause decomposition to occur. Many times, the wood will need to be chemically treated and patched to save it. We can do this, as well as repaint or stain the wood afterward. If we believe the wood is too rotten to save, we will replace it for you. 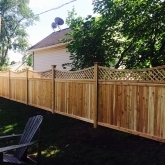 We are the best New Fairfield fencing contractor to call for repairing or replacing any rotting wood on your fence. Fence poles are necessary for structural stability and can shift over time. 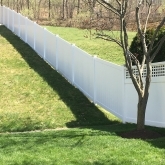 If this occurs, a large part of the fence can get damaged if it falls or deteriorates. We can replace your fence poles or repair them, giving your fence a longer life span. You may have holes and cracks in your wood that we can repair. 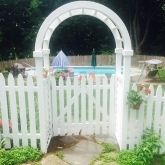 Depending on your specific type of fence, the actual repair process will differ. To keep your fence in the best shape possible, we recommend patching any holes and filling up cracks as soon as you can. We are here to do that for you. We often fix fences that have missing boards. The type of fence you own, as well as the height and length, will make each repair process different. You will want to fix the missing boards as soon as you can so that the fence does not collapse, which will cost more to fix. Call Roots Landscaping to find out how we can repair your fence and to get an estimate on costs. 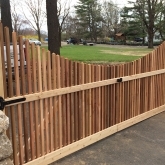 Roots Landscaping provides the best fence installation and repair services in New Fairfield, CT. Just call us today to find out more. Don’t worry if you are unsure of what you need or want, just give us a call at 203-304-7326. We can help you decide on what is best for you. We also offer expert masonry and landscaping services. Roots Landscaping is top-rated and we are accredited by BBB standards. To learn more about our company and how we can help you with your landscape, please call us today. For more information about our company, services and team, call 203-304-7326.